You can choose the ribbon color of your choice! 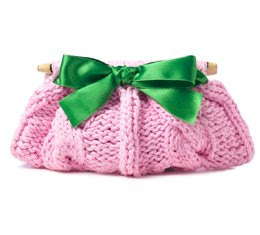 My mother knit purses almost identical to that for everyone in my wedding party! Wow--I'm sending her the link to show her how much money I saved her from having her knit 12 of them! Hi there! That is soo very adorable!! It's perfect for winter too. So cute! Too bad I can't knit...cause I'd make one of those. That is so adorable. I want one!!! I love it! I may make my roommate knit it for me, or I'll buy one! Wow - very cute and VERY expensive! Thank you again for the folder & sticker! OH MY GOSH... you find the cutest things. I LOVE this. that is the cutest little bag! i think i'm going to try to knit one myself... how hard could it be? Oh Miss Kate, these are *so* fabulous, we just love them. Very cute! Love it!! My mom knits I should see if she can knit this.